One of the things I love most about having a handmade business is the creativity that comes with it. It’s so great to talk to people and take on a challenge. And I just have to tell you about a project I got to do recently. A little bit ago, a client wanted something special for her goddaughter’s first birthday. Something that would show the little girl how much her godmother loves her, even though they’re far apart. A shirt? Nah – she’ll grow out of that…A blanket? I’m sure a baby girl has about a million and three baby blankets. Nothing seemed special enough. I’ve gotten to know this S (my client) fairly well – she’s not only a client, she’s an awesome neighbor and friend. One thing that is clear the instant you meet her is that she has a huge, loving heart. This gift needed to be personal, and illustrative of how much love she has, especially for someone as dear to her as her goddaughter. Then it hit me: a pillow! Something that the little girl can cuddle with when S isn’t around to cuddle with her. We settled on a pillow in the shape of the state with two hearts connecting the locations with a saying on the back. 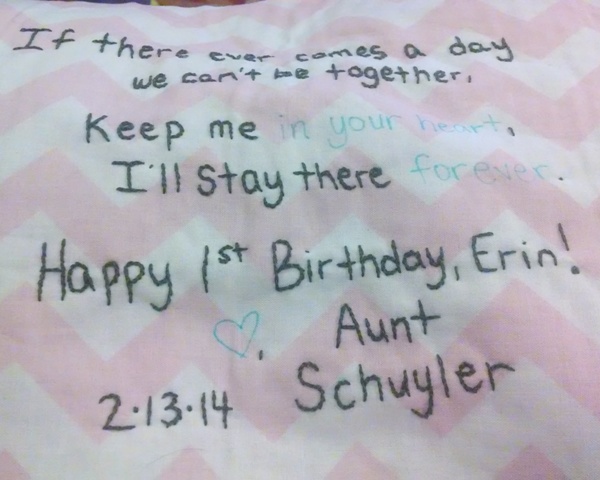 And to give it an extra personal touch, I had S write the message on the fabric with a water-soluble pen. Thankfully, S was a kindergarten teacher, and has impeccable handwriting. I then hand-embroidered over the letters, hearts and dotted line between hearts. I love how this turned out. It was a lot of work. A LOT of work, but I loved it. I loved the entire process of creating the template, figuring out fabric (you can’t go wrong with baby pink chevron for a baby girl, can you? ), picking out the right shades of medium charcoal grey and hot rosy pink for the thread (because the standard black lettering with red hearts simply wasn’t going to work), stitching out each letter and making ‘forever in your heart’ stand out, the millions of times I had to go and spray the fabric to get all of the ink out, and finally sewing, stuffing and stitching it closed. It was all so satisfying. As I worked on it, I kept picturing the little girl and wondering if she’d love the pillow as much as I’ve loved working on it. Will she cuddle with it when she’s afraid of a storm? When she’s in the midst of her teenage angst, will she hold it and think of her godmother and know/feel that she’ll always have someone on her side? Will it be on her bed in her dorm room someday? Thanks, S, for letting me be part of this beautiful gift! 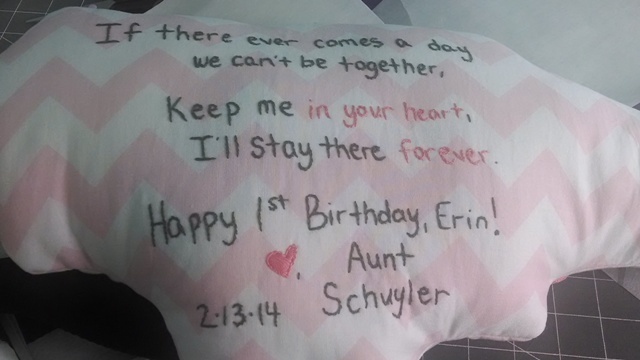 This entry was posted in crafts, creativity, Handmade, Products, Sewing and tagged hand embroidery, handmade, North Carolina, shaped pillow, state pillow on February 27, 2014 by aliciamariel.